Since the PepsiCo Workers' Union was registered and officially granted collective bargaining rights, union officers have been targeted for disciplinary procedures on false charges and the union president has been transferred out of the plant to prevent contact with members. The company has registered a fake national union claiming to represent workers at two different sites in order to undercut the Lahore workers' demand for a negotiated collective agreement. Union members are being denied overtime and pressured to leave the union. Workers initially formed a union in response to the massive abuse of precarious employment through labour contractors, which denies permanent employment to workers who have worked for years at the plant. 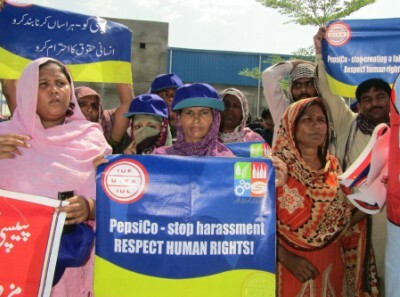 CLICK HERE TO SEND A MESSAGE TO PEPSICO, telling the company to respect trade union rights at the Lahore plant and end its ongoing complicity in violations of the rights of workers who were unfairly dismissed and then denied reemployment for defending their rights at a warehouse in West Bengal India contracted exclusively to PepsiCo.